Q: Why does it cost so much to ship overseas? A: Shipping is not exact science! I never know what someone may order? I have gotten orders as small as pair pants and shipped to the UK and by time I returned home I LOST -99c. My shipping levels are tiered based on the “amount” you order. For example some expensive watch may be light and you might be overcharged some or couple heavy auction catalogs may weight 8lbs and I will not normally get enough from you. Therefor I will watch ever box as it ships, if you paid too much it will be refunded at that time, if you paid too little I will request the additional fees and as courtesy I ask that you agree to pay the additional charges. **NOTE** USPS rates saw an overall increase of 10.2% in 2016-2017. This increased as of Jan 17th, 2016 and I had to increase as well. New rates can be seen HERE. Q: Will my order have tracking? A: ALL orders have some type of tracking or delivery confirmation assigned to them. This number will be sent out via the site at the time of shipping AND Paypal® will be updated with the same info for your records. First Class international orders normally just have basic tracking showing when the item shipped and when it was passed off to an overseas carrier. USPS® Priority or Express mail, UPS® or FedEx® items all have detailed tracking and insurance in case of loss or damage. Many countries will charge a import tax and the buyer is responsible for pick up and payment of all fees to customs. If a item is returned due to no payment or not picked up, the shipping will need to be paid AGAIN for the item to be shipped a second time. No refunds are issued, credits maybe issued on case by case basis at the discretion of Stitch’s Loft. Q: What if I do not have the money to get everything I want? Q: Why do Jackets take so long? A: Jackets being my only “outsourced” item are still made custom per my instructions and specific details are listed per order. No one else makes the jackets with the care details I have put into them! Unfortunately a jacket order normally takes 6+ months and have taken as long as 9-12 months in extreme cases. Please be patient!!! I must procure all the material per your order then get them shipped to me and then ship them off to my tailor, often awaiting his backlog and then wait for them to be shipped back to me in batches, then we will ship off each order to the customer once received and checked and then completed by myself for accuracy and add-on’s like patches. I do my best to get them out as fast as I can! No one has EVER not got what they have ordered and in all my years no one has ever asked to return something for a refund other than one SGA Headset from eBay. He didnt like it… I feel you will be pleased with my work every time. If there is ever an issue please let me know! My customer satisfaction is always my priority! A: Many of the items like tac-vests are done per order and can be a lot of sewing for me. Often I may need to order parts just for your order or supplies. Certain times of the year I get backlogged and you may need to wait in line. Unfortunately I do not always have these items in stock and may need to purchase supplies for your order. Every order is hand crafted for each individual customer. We carry some “in-stock” items. Remember during the busy con seasons that there are other customers who ordered before you, if they are not in need of something and you need something fast I “may” at my discretion move you to head the line if it will not impact the progression or interfere with the other orders I am working on. This is done on a case-by-case basis and can not always be accommodated. Even some medium sized orders may take in the range of 8-12 weeks for a custom vest order. Even simple BDU’s will take 2-4 weeks on average… I will need to order them in your size and color get them in (not always in stock from mfg) but at time can be back ordered a couple weeks and then will need to do your sewing for patches and velcro! Order AHEAD of time of your events!!! On daily basis I may be processing and working on some 20 orders and have another 10 awaiting parts. We do have families and lives and and often life can get in the way of progress. We do our best to meet all deadlines and events, but please order early. We may take a rush order if worked out with us prior to ordering. However, even with the best intentions delays can still happen with material shortages, customs delays overseas, and backlog. Q: Will I be charged taxes on my order? A: As per New York State Law we are required to charge tax on any order shipped to a New York State address. NOTE: I also have no control or influence on import duties in foreign countries! These fees are the buyers responsibility to pay upon release from customs. We also do our best to have clear and legal customs documents on a fair market value of each item, NOT what it “maybe” worth in the prop community. So often items are priced higher due to labor for mods, prices that include labor is not listed nor should be taxed. That said, please do not ask me to commit fraud and be aware that countries like the UK, Netherlands, and Australia often have import fees even for items marked as a “GIFT” so do not ask me to do that either. You may have to pay to get your box that’s is out of our control! Q: Why do some items cost so much? A: We obtain the best fabrics and supplies on the market and spend hours making sure you order is complete and will fit you with the best details possible. 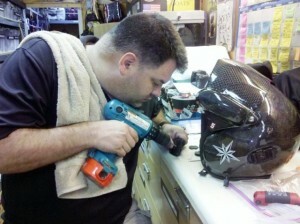 Costuming is not a cheap hobby and to do it right and look the best it does come at a price. We have dedicated many years of our lives to our trade and provide professional looking products that hold up to real world or the costume world standards. I at times will even offer law-a-way options for payments of you think you will do better at making payments over a short time then letting me fill your order once full payment has been received. Q: Do you have my costume in stock? A: Almost everything we sell is custom made to order. We have very few items always in-stock especially if ordering BDU’s or custom jackets or full costumes. Some small items may be available to ship right away (i.e. pins, patches, or vests) all other items are available on a custom order basis only. Large orders should be ordered well in advance of when they are needed. Please bear this in mind when ordering during con seasons. If you need something by certain date I am happy to ship partial orders but you as the buyer will be responsible for any additional shipping costs later for remaining items not done or received at the time of shipment. Any shipping costs not used will be applied or credited, however additional charges may apply and will need paid BEFORE the remaining part of the order is shipped. Q: Did you work for MGM or on the Stargate? A: No, I have volunteered as book editor and consultant for two of of the live auctions of props and costumes sold for MGM, but I have never worked for MGM or on Stargate. 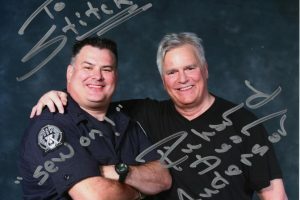 I have toured the set of SG-1 and Atlantis and had many photos taken in costume on the set. I have however worked on three motion pictures. I briefly gathered props for the rescue scene at the end of Ron Howard’s (1995) film Apollo 13. In 2010 I was given small role as UCAV Technician and was hired as a military prop and costume consultant working on the set for 6 months on Martin Campbell’s (2011) film Green Lantern. Two years later I was again called for consulting on ENDERS GAME (2013). We currently have a demand for American Flags from NBC Revolution©. Note: Stargate SG-1, Stargate Atlantis & Stargate Universe are TM & © of Metro-Goldwyn-Mayer Studios Inc. 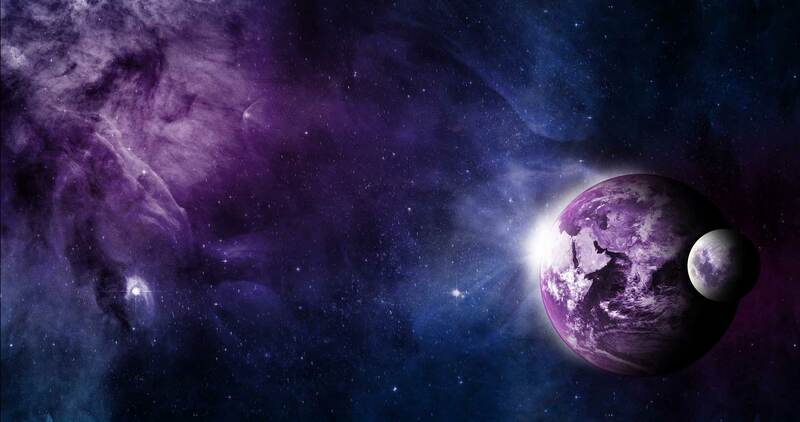 This site is in no way sponsored or endorsed by: SyFy, MGM, George Lucas, Lucas Film Ltd., Lucas Arts Entertainment Co., Warner Bros. Entertainment Inc., Star Wars and all its characters are © and TM by Lucas film Ltd. Firefly and all their characters are © and TM by Joss Wedon and Mutant Enemy Productions. 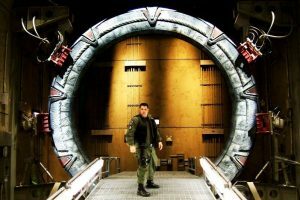 This site was created solely to assist fans in sci-fi costuming, and help others keep the passion and love of Stargate and other shows alive. Stitch’s Loft is a fan based business and is not intended to infringe upon any copyrights or registered trademarks. Q: What if I have an issue with my order? A: We want your Satisfaction Guaranteed- Since the idea of our company and we began dabbling in props and costumes back in 2005, my philosophy has been simply to offer quality props, costumes, and service that I guarantee 100%. Since becoming a licensed business, we are always focused on keeping our customers satisfied and to ensure they are happy with their purchase! If there is ever a problem we encourage you to let us know, so we can do everything possible to make sure you are satisfied. A: We want your Satisfaction, however, many times if an order been placed we have already paid for many parts and started on your order it is not always possible and will be reviewed on case by case basis. If this is lay-a-way plan and it early stages we can sometime cancel and refund what had been placed down, but again if its far into the plan we have already secured parts and time for your order it may not be possible. Stitch’s Loft however at times will buy back and item you have purchase or even used at fair price, we ask you contact us FIRST before selling our items on eBay or other points of sale. Q: Is Stitch’s Loft a REAL business? 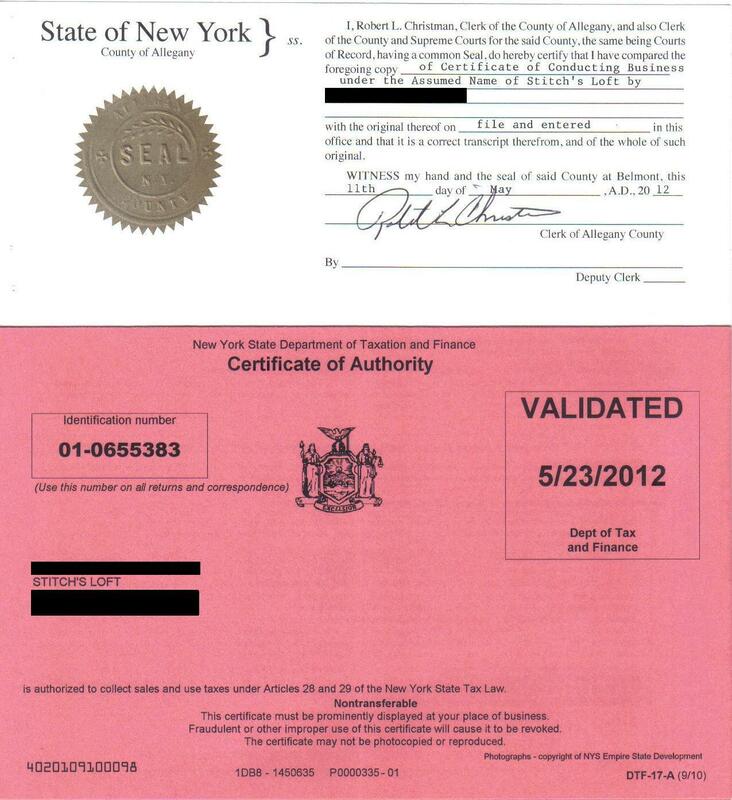 A: Yes, we are real licensed business in the State of New York and have authority to collect sales tax within the state of New York. Below is copy of our business licenses and New York State Tax Authority. So please remember this, this is real business and needs to be treated as such. I am not just some Cosplay guy trying make money of Social Media. I run serious business and one day hope to open my own store and offer custom embroidery, industrial sewing repairs, tac-gear for police, fire and survival equipment for hunters and survival enthusiasts.